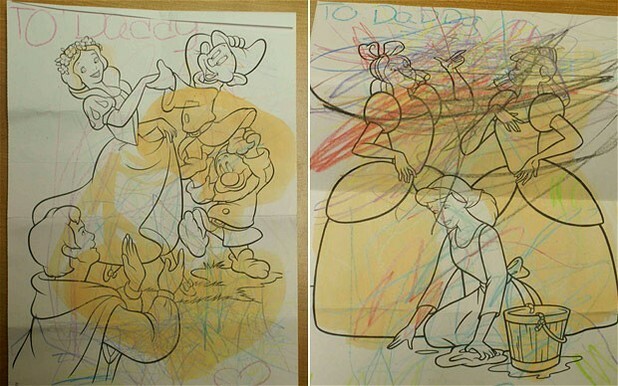 New Jersey prison authorities arrest 5 after uncovering a drug smuggling operation wherein Suboxone was mailed to prisoners - dissolved and painted onto the pages of children’s coloring books. After an anonymous tip, authorities at the Cape May Correctional Facility in New Jersey started to closely examine the contents of coloring books that inmates had been receiving in the mail since February. They found that the pages, which were covered in scribbling, a lot of orange ‘coloring’ and an inscription, “To Daddy” were actually painted with dissolved Suboxone (the orange) which inmates could lick off the pages to get high. Suboxone, is an opiate drug which is used similarly to methadone, to treat opiate addiction. 5 people have been arrested for their roles in the creative drug distribution plot, including three inmates of the facility and the mother of one of the inmates. In commenting on the lengths that those incarcerated will go to smuggle drugs into prison, Cape May County Sheriff Gary Schaffer said, “Thirty-eight years in law enforcement, and I've done narcotic work, undercover narcotics myself, and I've never seen anything like this."